This page describes basics of Bitcoin Blockchain. It mentions Blockchain technology underlying Bitcoin. • A record repository of ordered collection of blocks is known as Blockchain. • Here block refers to list of validated transactions defined around time frame when the block was created. • A reward driven system for achieving consensus based on "Proofs of Work" for helping to secure the network. • Transaction refers to inputs from network participants which describe changes in asset control or insertion of contracts and/or related legal documents. In other words, a transaction is an asset transfer between two or more participants. For example John gives a car to Anthony. A participant is a member of a business network e.g. Customer, Supplier, Government, Regulator etc. Blockchain records history of asset control and state changes as well as creation of contracts and legal deocuments. Blockchains are an emerging technology pattern that can radically improve banking, supply-chain and other transaction networks, giving them new opportunities for innovation and growth while reducing cost and risk. There are two types of repository used in Blockchain technology viz. Centralized and Shared. Figure-1 depicts the same. Blockchain technology offers a way for market participants to access dematerialized assets directly without always going through other participants needlessly. In Centralized Repository, most participants are disconnected from their asset depository, settling transaction would require participants to collaborate in a flow that is slow, inefficient and expensive. In Shared Repository, all participants can interact with depository directly without going involving third parties, potentially making post trade operations cheaper and faster. Financial industry and banking applications are suitable for Blockchain technology. Trading, clearing and settlement functions can all be automated on a blockchain network using smart contracts and oracles. The Blockchain is radically changing the future of transaction based industries. 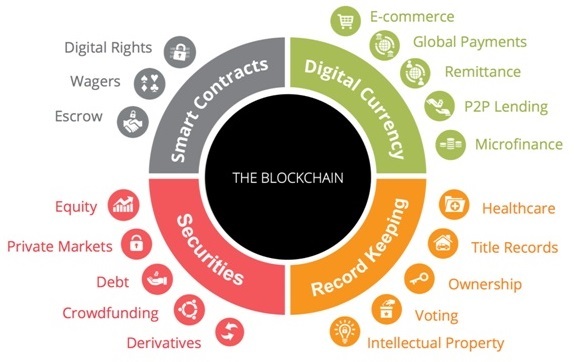 Figure-2 depicts potential applications and disruption of Blockchain. ➨A protocol that supports a decentralized, pseudo-anonymous and peer-to-peer digital currency. ➨Bitcoin is a publicly disclosed linked ledger of transactions stored in a blockchain. ➨There are different versions of Bitcoin technology viz. Bitcoin 1.5, Bitcoin 2.0.